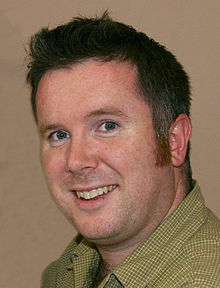 Curtis Jobling (born 14 February 1972) is a British illustrator, animator and author, born in Blackpool, England but lives in Warrington. He is best known for his role as production designer of children's TV hit, Bob The Builder, where he visualised all of that programme's characters and sets. Jobling is also an author and illustrator of children's books, notably Frankenstein's Cat, a muddled up feline. The first series of Frankenstein's Cat has now aired on CBBC and BBC1 in the UK. Frankenstein's Cat has also aired in France, Australia and South America. Curtis' new pre-school show, Raa Raa the Noisy Lion, about a noisy lion cub and his Jingly Jangly Jungle friends is currently in production by Chapman Entertainment and McKinnon and Saunders, and first aired on the BBC's CBeebies channel in Spring 2011. In 2010, Curtis signed a two-book deal with Puffin for his young adult series of fantasy horror entitled Wereworld. The first novel, Rise of The Wolf, was released in January 2011 in the UK, and short-listed for the Waterstone's Children's Book Prize 2011. The US edition will be released in Fall 2011. Following the huge success of Book 1, the second book, Rage of Lions, which was originally scheduled to be released in January 2012, has been brought forward to Summer 2011, with books 3 & 4 released in 2012, and books 5 & 6 released in the summer and fall of 2013 respectively. He is also a fan of the rugby team Warrington Wolves (nickname Wire) and has been seen singing "Wire Till I Die" in the stands of a stadium, and an avid fan of the Walking Dead television series and graphic novels. ^ "Bob the Builder designer nominated for children's book prize with debut novel". ^ "Bob the Builder writer gives pupils a story-telling masterclass". ^ "World of Warriors - A NEW HERO - Tour".